This was a stunning blast from the past, courtesy of Joel Griswold last night. 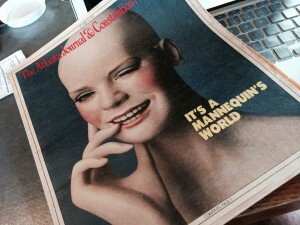 He was a source in this 1979 cover story I wrote for the old Sunday magazine at the AJC. It’s well over 5,000 words, I think. Yes, that’s 5000 words on mannequins. My few years under contract with the magazine were the best gig I ever had. Editor Nancy Smith encouraged me to write as many words about as many bizarre topics as I chose. She even paid me an ideas fee, since I couldn’t possibly write every story that came to mind. There are very few places you can write anything of depth with a strong narrative these days. The death of what’s now called long-form writing began in the mid-80s with the advent of USA Today, whose founding editor, Ron Martin, became AJC editor around 1989. I remember Mr. Steve Murray, the theatre critic, telling me writing more than six inches became an exhautsting rarity there. When everything turned into 750-word stories, journalism became uninteresting to me and that’s why I went back to school for a master’s and PhD in psychology — probably a mistake. I recently saw a list of the least financially rewarding degrees. Number 1 is journalism. Number 2 is psychology. I presume these are undergrad degrees, but I’m living proof of the list’s general accuracy. As I’ve often said, I want a third career as a cat sitter. In seriousness, I’ve become weirdly fascinated with human relationships with other species — how they see us. I suspect they have more complex feelings than mannequins do, but then again, mannequins are like human rorschachs. How we see them from moment to moment is a reflection of our own changing perceptions. Anyway, thanks to Joel for adding another memento to my nostalgic ruminations.